The Energy Information Administration (EIA) has suggested potential impacts from the much-anticipated switch to ethanol from MTBE by major gasoline producers before the driving season in 2006. This rapid change-over, which is in-line with the state bans due to water contamination concerns, could result in supply dislocations and price volatility. MTBE - methyl tertiary-butyl ether is a fuel additive used by many refiners in gasoline as an anti-knock compound and to raise the oxygen content to meet a now cancelled EPA requirement. This additive has been found to cause numerous health problems and is a suspected carcinogen. It has been accumulating in ground water to dangerous levels rendering the water undrinkable. The MTBE phase-out is also prompted by continuing liability exposure from transporting MTBE-blended gasoline and the perceived potential increased liability exposure due to the elimination of the oxygen content requirement for reformulated gasoline (RFG) included in the Energy Policy Act of 2005. EIA said that there would be a net loss of gasoline production capacity of about 5%-6% or 150,000 to 300,000 barrels per day outside of California this summer. 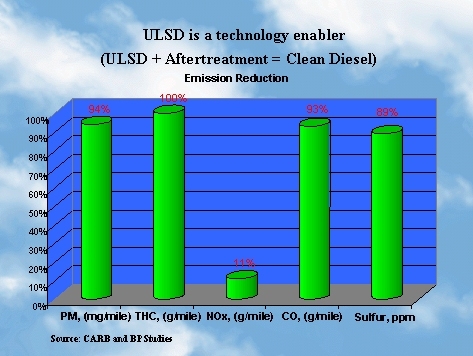 This is due to the necessary changes to accommodate the higher evaporation properties of ethanol and to counter the toxic emissions and distillation characteristics of ethanol-blended gasoline. This phase-out may actually add $.03-$.06 per gallon of gasoline during summer driving season. The use of Optimax as a bulk gasoline additive offers significant improvements to all grades of gasoline.